Al Sharpton is showbiz -- a former boy preacher, turned reckless demagogue, turning (he hopes) into an elder statesman of Black America. He has always loved the limelight and hung out with celebrities such as Mahalia Jackson, James Brown, Michael Jackson and Don King. Say what you want about him, he's certainly entertaining. He grew up in a prosperous, suburban family (his dad was a landlord and businessman) and was a child prodigy as a preacher. By age 7, he was touring with gospel great Mahalia Jackson and Bishop F.D. Washington, the renowned Pentacostal minister of Brooklyn's Washington Temple Church of God in Christ as "the Wonder Boy Preacher." At age 10, however, his parents divorced due to an affair his dad had with Sharpton's half-sister (ie his dad's step-daughter.) Sharpton's mother was forced to go on welfare, and at one point they went without electricity for 6 months. Al became an ordained minister shortly after his parents' divorce. Since then he has led numerous publicity grabbing protests following incidents of racial attacks and police brutality (such as the police assault of Haitian immigrant Abner Luoima) and formed a national action network (called "National Action Network") with 20 chapters around the country. In other words, like Pat Buchanan and Jesse Jackson, he is a political figure famous for incendiary talk and not much else. The television show HBO's Real Sports with Bryant Gumbel showed a 1983 FBI videotape in which Al Sharpton is seen talking about laundering drug money with former mobster Michael Franzese, a Mafioso-turned-undercover-FBI informant posing as a cocaine dealer. Now you might think something like this might be bad news for a presidential candidate, but to hear Sharpton talk about it, there's nothing unseemly about it. Sharpton got into this mess through his friendship with boxing promoter Don King, a longtime friend of his. Franzese, a former Colombo family captain, alleges that a South American drug dealer looking to launder money through boxing promotions approached him. According to Franzese,Sharpton was going to arrange a meeting between the dealer and King. But the drug dealer was really an undercover FBI agent in a probe of boxing corruption. Sharpton claimed the tape was a "total attempt to set up and criminalize people," that it was leaked to scuttle his possible presidential bid, and that HBO distorted the evidence by showing only selected portions of the tape. He also clamed that a second tape existed that exonerated him. Any leader needs to build coalitions among diverse groups and individuals. And no individual is more diverse than Sharpton's recent ally, Michael Jackson. 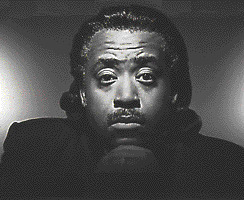 Sharpton made his name and his fame as the one to lead a protest movement after every racially charged incident in New York over the last 30 years (and many elsewhere in the U.S.) Especially early in his career, he seemed content and even eager to inflame racial hatreds at the risk of violence, as long as it gave him publicity and power. Two incidents however appear to have caused him to tone down his excesses and refine his image. First, in 1987, black teenager Tawana Brawley claimed that six white law enforcement officers -- including then-assistant district attorney Steven Pagones -- had abducted and raped her, scrawled racial insults on her body and smeared her with feces. Miss Brawley refused to speak with authorities or the media, but Sharpton and her two other advisers were soon making wild claims. Sharpton compared then-state Attorney General Robert Abrams, a Jew, to Adolf Hitler. All three linked then-Gov. Mario Cuomo to organized crime and the Ku Klux Klan. Within a year, a grand jury announced the story was a hoax and specifically cleared a Fishkill police officer and Pagones. Pagones sued Sharpton and the other 2 advisers for more than $150 million for defamation. At this point, Sharpton's involvements is similar to George Bush and the Iraqi uranium purchase forgeries -- it's unclear if he was actively involved in fraud, or just recklessly willing to use information he knew was very shaky to make his political point. The other turning point came in 1991 when Sharpton was stabbed by a drunk white man during a protest march in Bensonhurst; after that he began to mellow. "There are times [since the stabbing] when I've found him remarkable and responsible," says critic Stanley Crouch. He recalls that after the murder of Yusuf Hawkins, a young black man from Brooklyn, Sharpton brought together Hawkins' stepfather with one of the group of white boys that had killed his son. "This would have been more recognized had it been someone like Giuliani," says Crouch. "After the Diallo verdict, he discouraged people from being violent," warning locals in New York that violence would not only put them in harm's way, but it would reduce them to the low level from which the unjust verdict originated," he notes. "So you have these great moments. He's also taken a more mature vision of the police and moved to differentiate those good white cops, who enforce the law properly in tough and often dangerous environments, and bad cops)."